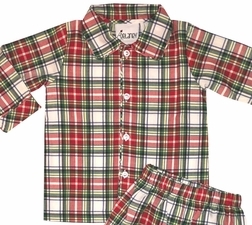 We just love these traditional plaid pajamas pjs for little boys that are perfect for Christmas eve, Christmas day, Christmas pictures and sleepovers! 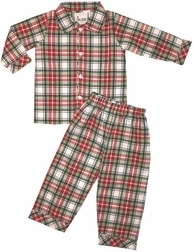 They are made with a lovely plaid with off-white, red, green navy and yellow stripes. The top has a pointed Peter Pan collar and cuffed sleeves. It buttons down the front. 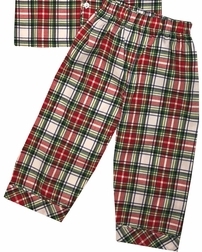 The pj trousers are also made from the plaid and have an elastic waist for better fit.